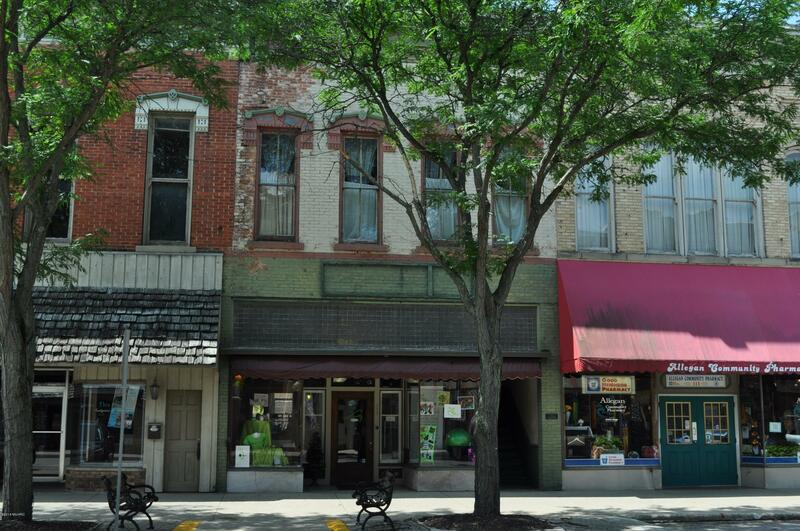 Prime Business location in the Heart of Historic Downtown Allegan! Main level features restored wood floors, 14' original Tin Ceiling, exposed brick & stone walls. Great Display windows! 2 rest rooms/1- Barrier Free. Street Parking and Rear Public Parking Lot. Entrances at each. Basement level is partially finished and includes 2 private office areas. 2nd Story holds potential future income with 2 apartments. Currently houses fitness Center, former uses include Restaurant and Hair Salon, retail.Call Sneller Real Estate 269-355-1919 or Listing Agent Carol Sneller 269-720-0580 for your Showing.